"This book inspires from beginning to end: it captures the sweat, the sinew and the soul of clown." More than one million people saw Cirque du Soleil’s Corteo with Jeff Raz in the starring role. Every night after the show, Raz hurried back to the hotel to do his “day job” as the director of the only school for professional clowns in the United States. The Secret Life of Clowns was born from Raz’s attempts to take the principles he taught at The Clown Conservatory into the grand chapiteau in front of 2,800 Cirque du Soleil fans eight times a week. The form of the book is modeled on Constantin Stanislavski’s brilliant trilogy that brought the Moscow Art Theatre to the world through the eyes of a fictionalized student. Since Raz was simultaneously running a school and starring in a show, he has doubled up on Stanislavski with twin narratives - a fictionalized Clown Conservatory and a backstage tour of Cirque du Soleil. Forget what you know about clowns. The Snow Clown brings to life a circus made to reflect, and reflect on, crossed borders. A thoroughly absorbing read. Some artists thrive by taking risks, exploring unknown territory, living on the edge. The title character in The Snow Clown takes this literally, flying tiny planes out to Eskimo villages in the dead of winter to teach kids who have never seen a circus. The unforgiving tundra and triple-digit wind chill are the least of his worries as he navigates a world where traditional Yup’ik culture is fighting off TV America and missionary teachers. 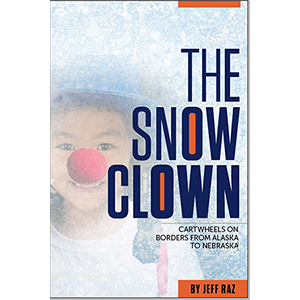 Years later, the Snow Clown finds himself in Nebraska, America’s Heartland, performing a comedy about the Holocaust and his father’s suicide. It doesn’t go well. He is a Jewish artist out on the plains where Jews are as rare as buffalo but burning crosses are not. Using skills he honed on the Alaskan tundra, he writes plays with students that blow the lid off of “Nebraska Nice” and eventually get him run out of town. Jeff Raz has performed nationally and internationally for decades, starring in circuses (Cirque du Soleil, Pickle Family Circus and more) and plays, including Shakespeare’s Comedy of Errors on Broadway. He is a graduate of Dell’Arte International, has written 15 plays and has directed dozens of circus, puppet and theater productions. He co-founded Vaudeville Nouveau in 1982, the S.F. New Vaudeville Festival in 1985, The New Pickle Family Circus in 1993, The Clown Conservatory in 2000 and the Medical Clown Project in 2010. His first book, The Secret Life of Clowns, was launched at the Smithsonian in 2017; his second book, The Snow Clown, is hot off the presses. 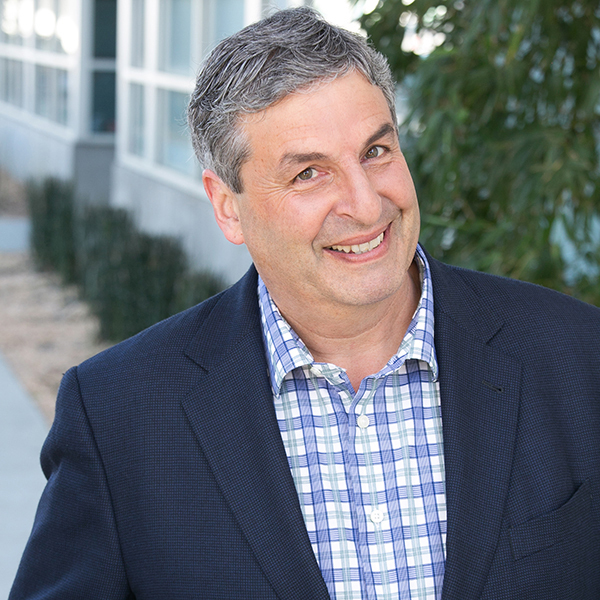 Jeff continues to write, perform, direct, and teach as well as work globally as a communications consultant with Stand & Deliver. Jeff Raz has drawn on his life’s work to write a pair of narratives – one following a professional clown joining a huge show, and one following a clown student who just wants a job in a circus. It’s a good book, and if you’re curious about the clowning profession, you’ll turn these pages. The Secret Life of Clowns emphasizes learning and development in a vivid and universal way with profound vulnerability, great humor and generosity of spirit. Raz captured two key, but often neglected features of the clown, wandering and being contrary. The clown sees the world differently than others, helping re-create a new world. David Carlyon, director, actor, ex-Ringling/Barnum clown, award-winning author of Dan Rice: The Most Famous Man You’ve Never Heard Of and Education of a Circus Clown. Forget what you know about clowns.The Snow Clown brings to life a circus made to reflect, and reflect on, crossed borders. A thoroughly absorbing read. What is a clown? And if you think you want to be one, what do you do? Jeff Raz has drawn on his life’s work to write a pair of narratives – one following a professional clown joining a huge show, and one following a clown student who just wants a job in a circus. It turns out the calling involves a lot of work, and, no surprise, it has mundane and spiritual sides that intertwine. The questions don’t all get answered – how could they? – but the oldest craft in the world gets examined, with just the right amount of historical sidebar. It’s a good book, and if you’re curious about the clowning profession, you’ll turn these pages. 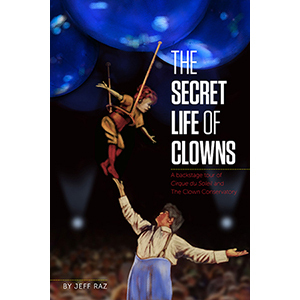 Jeff Raz has written a fun, informative read, an up-close-and-personal look at what it is to train as a clown, to teach clowning and to clown in one of the most renowned circuses in the world. This book is also chock-full of asides on the history of clowning, clown trivia and profiles of unique clowns. Could there be a more comprehensive take on the life of clowns? A spot-on account of the insecurities, the flops and the triumphs of a student of clown, whether in school or in the biggest circus in the world. It brought a lot of memories back, both as a clown with Cirque du Soleil and as a student of clown. I liked being reminded of the unknowns of it all, when it looked impossibly bigger than life. For an old clown, it jogs memories; for a new one, it’s insightful and affirmative to the challenging rites of passage. The Secret Life of Clowns is a lively, informative and engaging book. Jeff Raz writes from the heart and tells much of what he knows from his four decades as a performer in a way that readers will be able to follow and enjoy. Jeff Raz taught me that the performing arts are a business, that I should be vulnerable on stage but not when it comes to the business side. Without him I never would have had the courage to move to Dubai and launch ‘Dubomedy’. Jeff Raz is the perfect person to give the lowdown on what it means to train contemporary clowns, and what it means to actually be a clown – in the old circus, the ‘new circus,’ and in the theatre. He has been in the ring, above it, behind it and all around the life of today’s clown world. His wonderful passion for the subject is now generously shared in his new book, just as it has been shared for so long with students and audiences.